Though I had visited Hyderabad before, it was mostly on business trips and I hardly ever had time to do anything else other than getting a belly-full of biriyani from one of the famed outlets. This time however, I had both time and purpose to explore (did I say time? we'll see...). 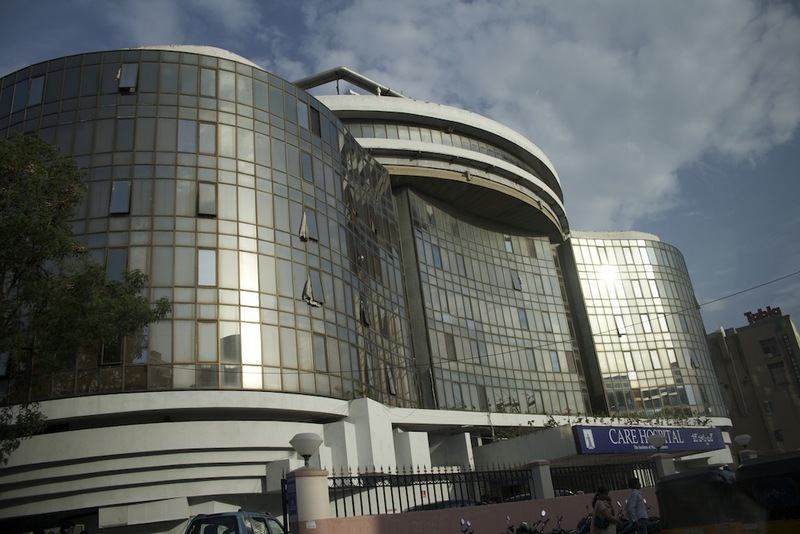 We reached Hyderabad by noon, and the city was bustling with activity. We never have had a GPS, and have always relied on two strategies - 1) use maps for the highway, 2) keep the map away and ask directions from people in populated places. Language is not really a barrier. From whatever experience we've had, one just needs to know how to pronounce the place name in local accent and know of other nearby places that common people may identify easily. Then use part sign language and broken local language, crosscheck directions often and gradually work your way from landmark to landmark. 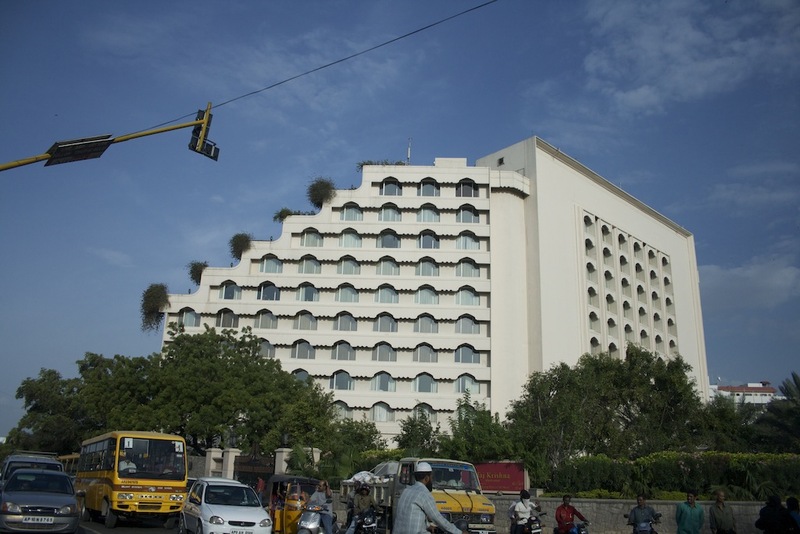 We had to find an address near Jubilee Hills (quite a famous location in Hyderabad), a relative's place we were to visit and possibly stay at. Hyderabad roads were notoriously narrow, crowded and devoid of any road signs and directions. I can't help but thank the people we asked directions from. Navigating though Hyderabad roads reinforced our trust on our way of finding way. The region that today is Hyderabad was part of the Bahamani kingdom. Way back in the year 1463, disturbances in this (Telengana) region forced the Bahamani rulers to dispatch one of their high ranking military officer, Sultan Quli Qutab-ul-Mulk, to this region to restore law and order. The Sultan did a great job and was rewarded by being made the administrator of the Telengana region, as a representative of the Bahamanis. Sultan Quli had Golconda as his base. He was an efficient administrator and ruled virtually independently from the Bahamanis, then based out of Bidar. The gradual weakening of the Bahamanis encouraged Sultan Quli to declare independence in the year 1518, and marked the beginning of the Qutab Shahi dynasty. The Qutab Shahi dynasty lasted 171 years since then till 1687, while the Bahamani kingdom broke up (by the year 1527) into four more kingdoms - those of Ahmednagar, Berar, Bidar and Bijapur. 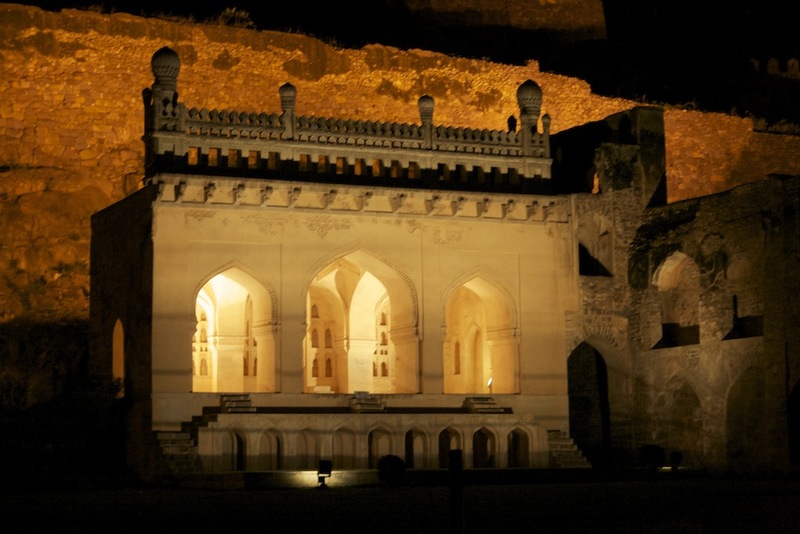 Golconda was a fort city, built on a granite hill. The original fort was built during the 13th century by the Kakatiya dynasty, after which it was passed on to the Bahamanis and then of course to the Qutab Shahis. Golconda was strengthened and grew with time along with the Qutab Shahi empire. It was pretty self sufficient and had many intricate and interesting structures that are standing even today. 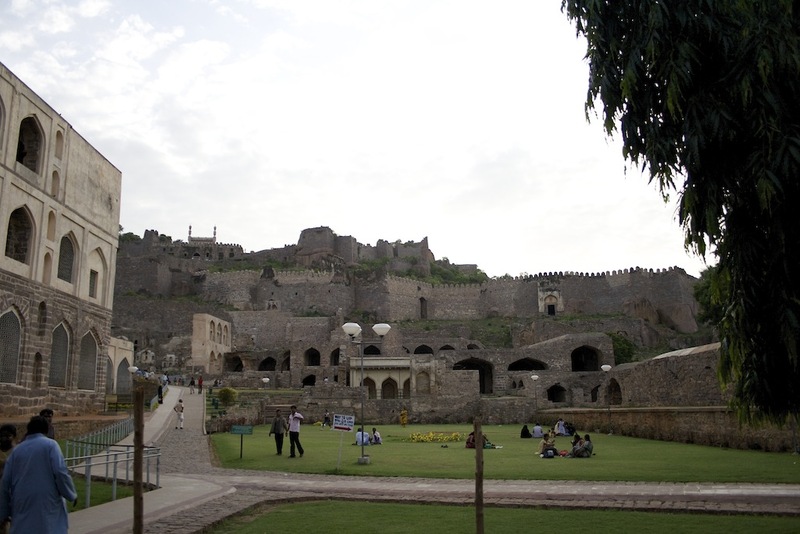 Golconda also had diamond mines and the precious stone was traded in the marketplace inside the fort. Going around the fort will take around half a day to one day. Taking help of a guide is strongly suggested for the first timer just to get a quick overview of the places if not for anything else; the area is quite vast. Apart from the regular information, you also get to listen to some romantic and some funny stories related to the fort. Armed with this introduction, one should then roam about the fort till evening. There is a light and sound show that is conducted inside the fort in the evening. 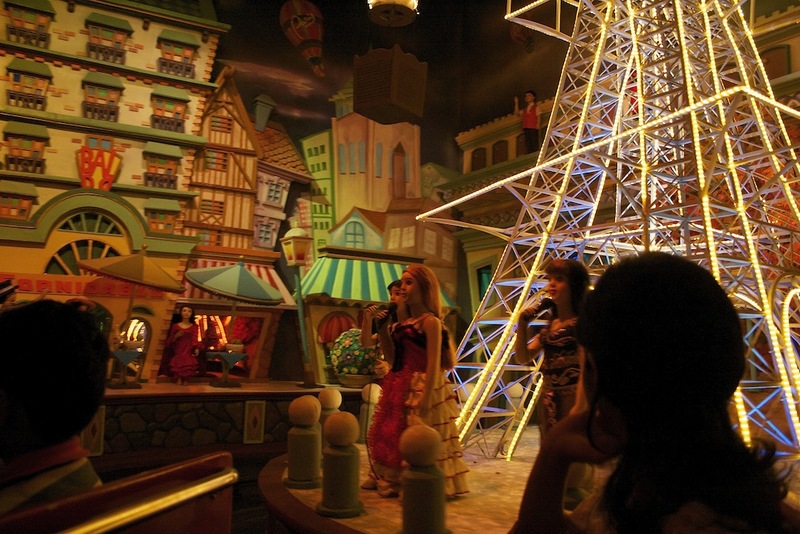 The show re-iterates most of what the guides tell you, but with some pretty lighting and sound effects. By this time, the monuments are lit up with colorful artificial lights - time for some more photography. As the Qutab Shahi empire out grew Golconda, the Sultan had to set up a new city. 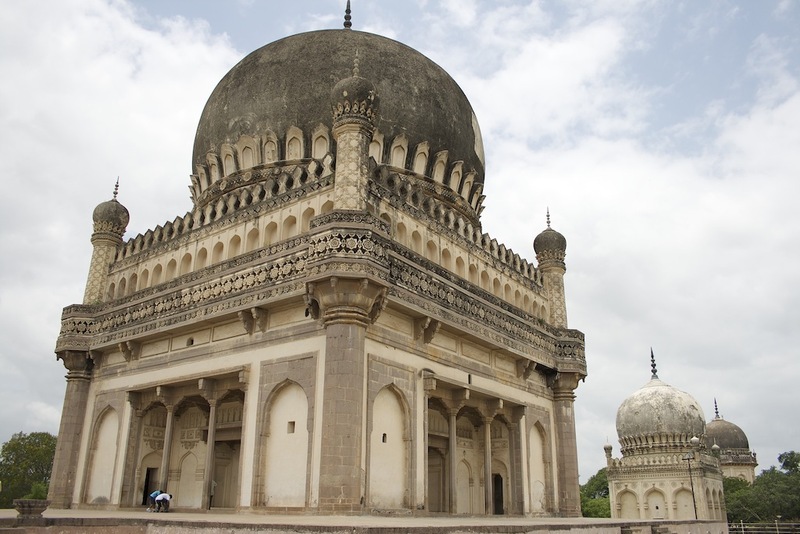 Around 8km from Golconda, this city was named Hyderabad after a prominent Muslim religious figure. There are also a few other explanations of origin of the name, but they appear to be more of folklore. Eventually the capital was shifted to Hyderabad. 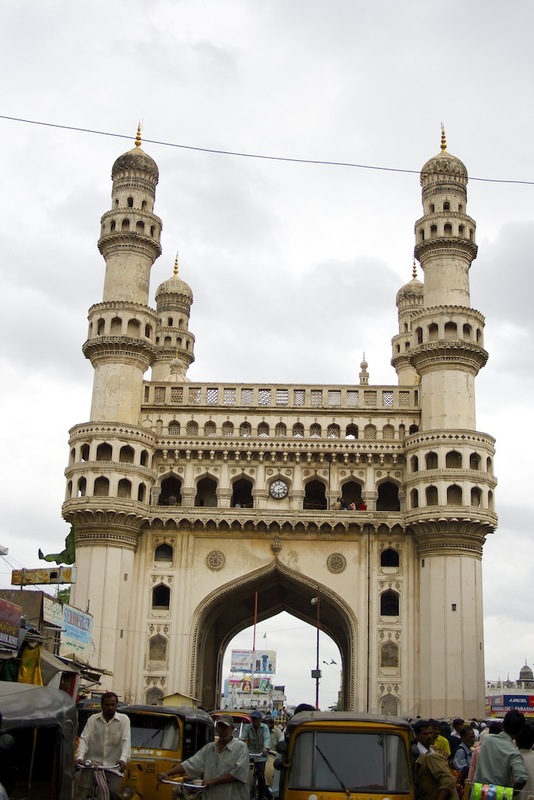 The Charminar was constructed with four tall watch towers overlooking the city to keep a watch on the city and the Musi river nearby to warn of flooding. Today, the Charminar lies on the middle of a busy road, from where you can still watch most of the city and the constant flow of traffic and people in the marketplace right below. 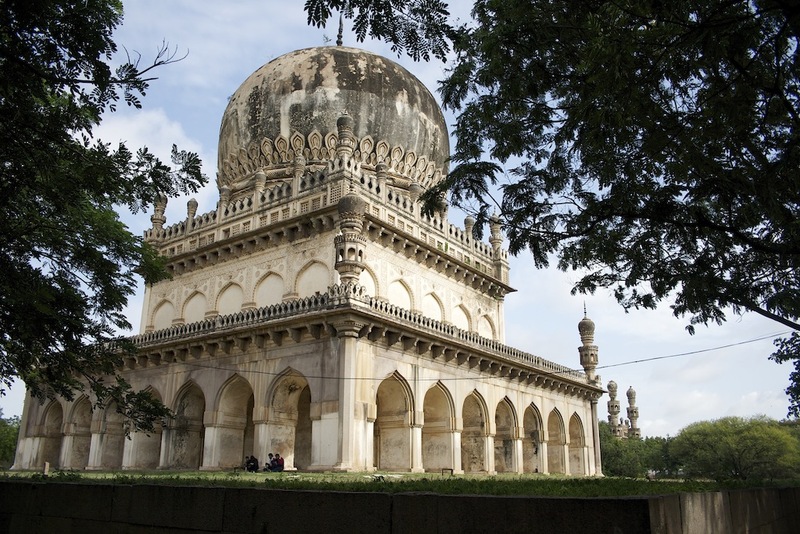 The place I liked most in Hyderabad was the Quatab Shahi Tombs. This is place where the departed Sultans of the Quatab Shahi empire were buried. There are around 20 tombs, ranging widely in size, all inside this quiet tree garden. The place is truly pleasant to walk and just laze around. The tombs loom around majestically, reminiscent of the past glory. The tombs are well marked, and in some of them you'll also find people present who will explain a few facts about the tomb. The tombs are located around 1km from the Golconda fort (one can see them from the edge of the fort walls), the place where the tombs occupants once ruled. The history of Hyderabad is not limited to what I have managed to cover in my short trip. I'm sure there is plenty more I have missed. There are also quite a few other places for fun and relaxation around. We spent some evenings at the Lumbini Park, right on the shores of Hussein Sagar. The Hussein Sagar lake was created by the Qutab Shahi's to store water from the Musa river and help improve irrigation and water supply to the capital city. Lumbini park, constructed in 1994, it is pretty recently built. 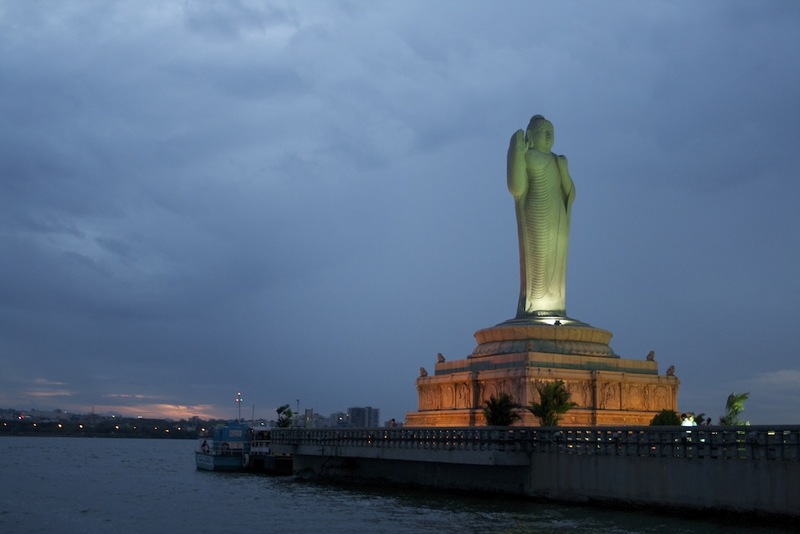 There is a huge statue of Buddha, supposedly the largest in India, to which boat rides are available. The park gets very crowded in the evenings. So after one general round of roaming around, we usually sat down quietly in a corner. 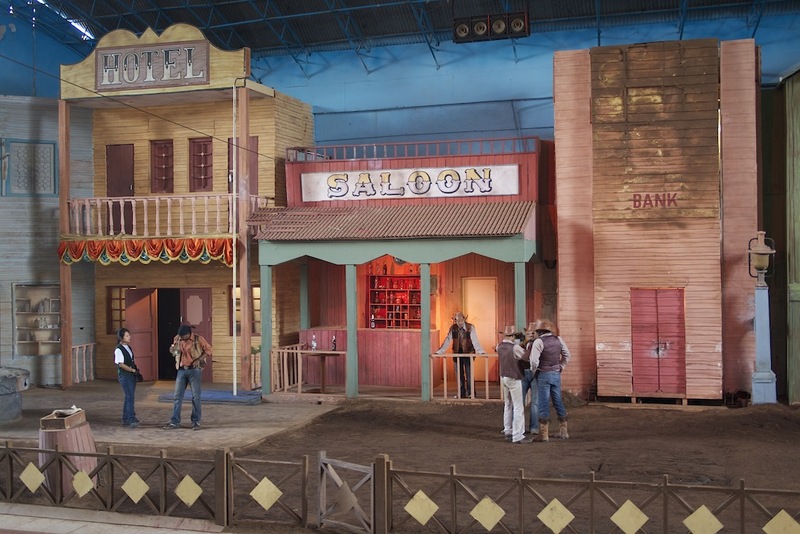 Hyderabad also has a huge film studio called "Ramojee Film City" that is also open to general public. I had always known that films are not reality. In spite of that, this place surprised me with new tricks in every section. There is this section where they show how a scene from the popular movie "Sholay" could have been made. It seems like a dream world. After a round in the film city, I was instinctively touching and knocking at stuff to check whether they really are what they appear to be. 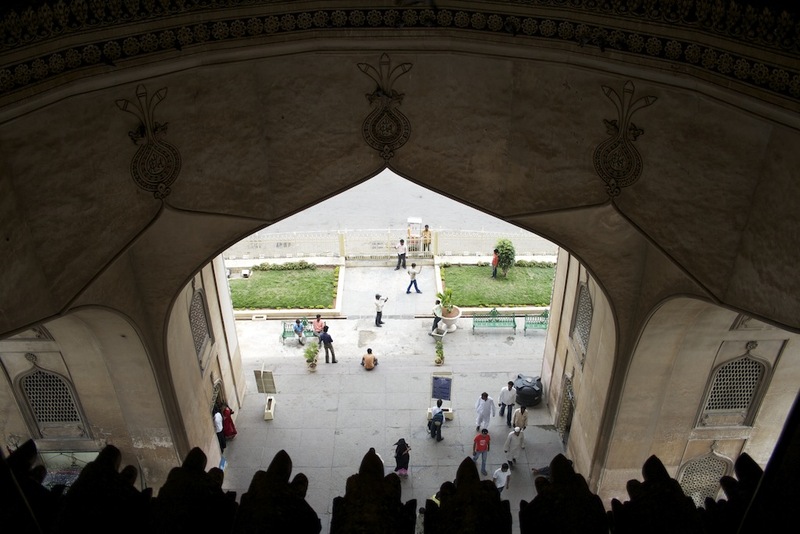 Hyderabad comes across as a city that is stretched taut between a strong cultural past and a burgeoning modern populace. Malls are as easy to spot as ancient tombs and palaces. The average Hyderabadi seems to have strong cultural roots, and as open at letting them go as the people of some other metropolitan cities. - Half day at Charminar. 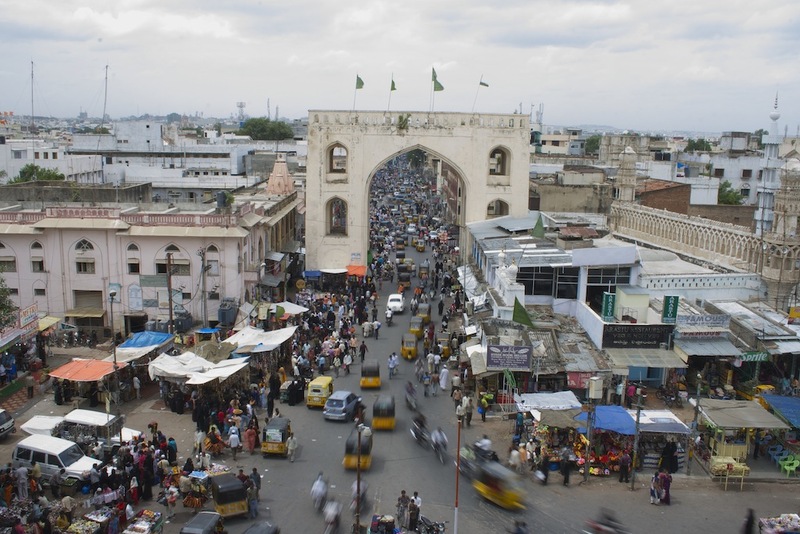 Spend some time in the streets and the market around Charminar. - Half day at the tombs. - A full afternoon and the evening at Golconda fort. - A full day at Ramojee Film City. - A evening at Lumbini park. - Some time savoring Biriyani from different places and biscuits from Karachi Bakery. For the next leg of our trip, we set off to Bidar. More on that on the next post. For the serious traveler, I would skip on the Ramoji Film City, and keep two full days for the Salar Jung Museum. A wonderful and comprehensive writeup, Tanmay!